Ko Muk and Morakot Cave are the most impressive points in the Trang Sea. Ko Muk and Morakot Cave are the most impressive points in the Trang Sea. The island is comprised of mostly high and majestic cliffs facing the sea to the west, while a fishing village is to the east facing the mainland. Swallow birds make the numerous cliffs their home. Hidden among them are the fantastic Morakot Cave. The cave entrance is a small passage on the island’s western side that is accessible by boat during low tide. The cave itself winds for about 80 metres to the other exit, opening onto a clean white beach surrounded by high cliffs. To get to Ko Muk, tourists can take a boat from Pak Meng Pier in Amphoe Sikao for the 40-minute trip. The boat rent is around 1,500 baht/day. Accommodation is available on the island. Coconut trees are standing against the wind at Ko Muk. 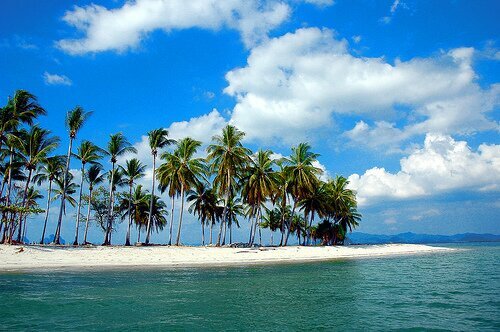 This wonderful island is located 30 minutes by boat from the Khuantungku Pier in Trang province. Most parts of the island are filled with towering rocks encouraging the swallows to inhabit along the cliff. 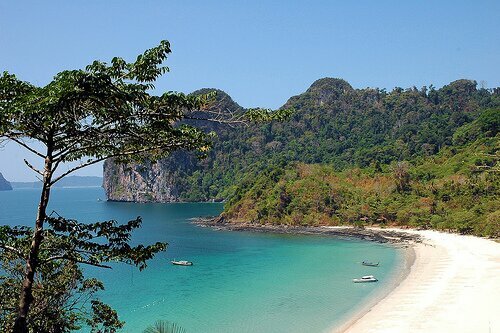 one of the fantastic attractions of the Unseen in Thailand is located at the west of Ko Muk. The exciting journey to Morakot Cave besides seeing the marvelous nature creation is the way to reach the cave by swimming one by one into the entrance of the cave with the width of not more than 10 metres and little area above the sea level. This can allow only a small boat to pass through during low tide along the channel of 80 metres long. After passing the entrance to the other side, one will stand at the large hall roofed by the sky looking like standing inside the very large funnel. The sand beach will be seen in the middle to the hall surrounded by high cliffs. Some species of plant are found either on the beach or at the cliff such as Caladium, spurge (Euphorbia antiquorum) etc. The sunlight during midday will be straight through the mouth of the funnel. The reflection of the sea creates the emerald color as the name “Morakot Cave” which means”Emerald Cave”. To get to Ko Muk and Morakot Cave, boat service leaves Kuan Tung Ku Pier at 08.00 hr everyday charging 40 baht per person. One trip by the rented boat will charge 400 baht and takes 30 minutes to Ko Muk. Upon arrival at Sapanyao Pier in front of the island, one have to rent a long-tailed boat to Morakot Cave rested at the other side of the island (100 baht each). 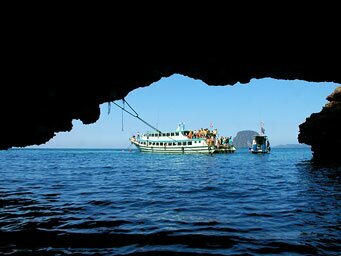 Another way is to rent the boat from Pak Meng Pier straight to Morakot Cave at Ko Muk. The rate is 1,800 baht/day taking about 40 minutes. 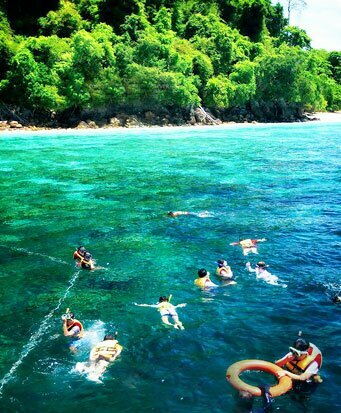 Tham Morakot is visited by swimming or by small inflatable boats. Starting from a ship, the swimmer has to enter the cave until he reaches a water filled chamber, which is lit by sunlight through a hole in the ceiling. The entrance passage is rather small and low, and it is passable only during low tide. If visitors miss the time inside, they have to wait for the next low tide to get out again. The name of the cave means Emerald Cave. It describes the emerald colour produced by sunlight filtered through sea water. 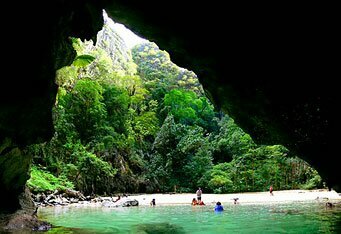 Inside the cave is a secluded beach of white sand. This cave played a small role in the enormous desaster of the 2004 Christmas earthquake and tsunami of southeast Asia. When the wave hit the cave, two swimmers were washed in, battered, and killed. Eighty visitior who survived the wave were resued after five hours. Another cave in the Hat Chao Mai Marine National Park is called Tham Chao Mai. It is located in the south of the park and is a dry cave above the sea with a small spring inside. It also only reached by boat, but it is not necessary to swim.